I have several friends who love to quilt and they just love our Big Shot Die Cut Machine. You can cut fabric as well as about 80 other materials, including paper, of course! 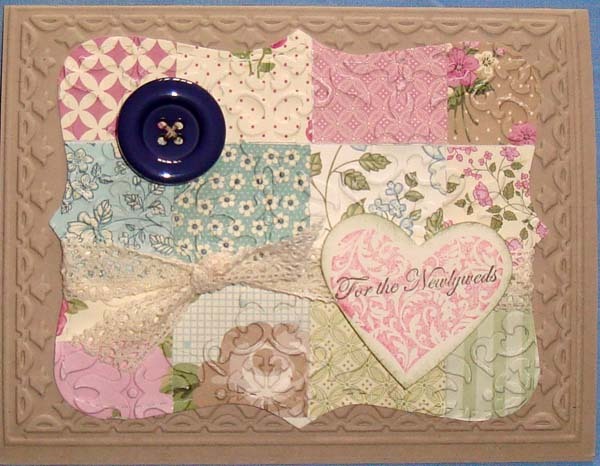 In this month's stamp club, one of my projects is a vintage quilt card. Our Springtime Vintage Designer Series Paper is tailor made for a quilting project (the matching fabric works just as well for a quilt pattern card) because of the double-sided designs on each sheet. For this card, I used the 1 1/4 inch square punch and 2 punched squares of the 6 paper designs. I also used the Victoria Crochet Ribbon and one of the BIG buttons that match the DSP and fabric. If you would like to get a few friends together, we could do this project at your free private class. Contact me to set up a date in April or May…I have 4 dates still available! Balloon Adventures Bundle by Stampin’ Up!